Hereditary pancreatitis causes progressive, debilitating pain and medical interventions may often be futile. Pancreatectomy has long been considered a measure of last resort for control of excruciating pain, but brittle diabetes is the permanent consequence. Islet autotransplantation improves glycemic control and minimizes long-term diabetic complications making this an attractive option. We describe three consecutive pediatric patients (all female, mean age 12.6 years, weight 71.1 kg, BMI 27.7) with defined genetic variants of hereditary chronic pancreatitis each presenting after years of debilitating severe abdominal pain requiring daily narcotics. Computed tomography imaging revealed calcific pancreatitis. Subsequently each child underwent pancreatectomy with islet autotransplantation (mean islet mass 333,430 IEQ, or 5,671 IEQ/kg). Pain control improved markedly without long-term opiates, early insulin independence occurred in all cases, and long-term insulin independence with excellent glycemic control was maintained in 2 cases. Hereditary chronic pancreatitis can be successfully managed with pancreatectomy and simultaneous islet autotransplantation, and should be considered for both children and adults that cannot be controlled by alternative means. We advocate this approach as first line surgical treatment to preserve maximal transplantable β-cell mass in highly selected cases with underlying hereditary pancreatitis. Pediatric patients with hereditary pancreatitis may suffer from severe debilitating pain refractory to medical interventions. Total pancreatectomy is considered in patients without alternative options to relieve severe chronic pain, but this procedure causes permanent and severely labile diabetes 1. Combining pancreatectomy with intra-hepatic islet autotransplantation, as initially developed by Sutherland, Najarian and colleagues in Minnesota in 1978, preserves endogenous β-cell mass minimising glycemic fluctuations and long-term diabetic complications 2. Currently islet autotransplantation can offer excellent short and long-term outcomes, with effective and definitive pain control, and rates of 30% insulin independence in adults, and 55% in children after 3 years, with the majority achieving stable glycemic control in the absence of hypoglycaemia 3 , 4 , 5 , 6. Chronic pancreatitis has a multitude of causes that can lead to devastating pain requiring opiate analgesia and can severely impinge upon quality of life 7. Chronic pancreatitis eventually damages insulin secretory capacity and ultimately results in diabetes. Furthermore, in chronic pancreatitis, risks of pancreatic malignancy increase to 1.8% after 10 years and 4.0% after 20-years with a standardized incidence ratio of 14.4 8. This relationship becomes more clear in studies with hereditary pancreatitis caused by genetic factors 9. Therefore, pre-emptive total pancreatectomy and islet autotransplantation may offer long term preservation of endocrine mass while eliminating risk of malignant transformation, and the application of this therapy before pancreatic ‘burn-out’ can benefit patients considerably 10. 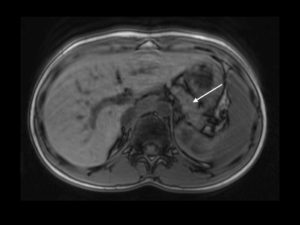 We report three pediatric patients with clearly defined genetic mutations that precipitated chronic pancreatitis who underwent total pancreatectomy and islet autotransplantation. After obtaining Institutional Review Board (IRB) approval to investigate outcomes post islet transplant (Pro00001120) parental consent/assent was obtained. One month before surgery all subjects received pre-splenectomy immunizations. Total pancreatectomy was performed with mobilization of the entire pancreas and preservation of both the splenic artery and gastroduodenal artery blood supply until just prior to explantation to minimize islet warm hypoxia 11. Reconstruction was performed whilst the pancreas was being processed in the islet isolation laboratory. Roux-en Y hepticojejunostomy and pylorus preserving duodenojejunostomy was utilized in all cases. A standardized protocol was used to prepare the islets under good manufacturing practice conditions. Initially collagenase solution was injected into the pancreatic duct under continuous perfusion and pancreatic fragments were then digested at 37 °C in a Ricordi chamber 12. The islets were transplanted within 4 hours after pancreatectomy as unpurified preparations to achieve the highest possible islet yield. Islets were infused over 30 minutes into the stump of the splenic vein under gravity after administration of heparin (70 units/kg). Baseline, continuous and final portal pressures were monitored throughout the infusion using a dual lumen 9Fr Broviac catheter (Bard Canada, Oakville, Ontario, Canada). Celiac plexus ablation with 20 mls of 50% ethanol was infused around the celiac aorta to facilitate effective pain control. A 14-year old Caucasian female was diagnosed with hereditary pancreatitis aged 6 after genetic testing revealed she was heterozygous for cationic trypsinogen mutation N21L. Before diagnosis, she had suffered from repeated bouts of pancreatitis with severe unremitting abdominal and back pain requiring chronic opiate medication. Her symptoms progressed and at age 14 years she was referred for consideration of total pancreatectomy with islet autotransplantation. MRI and CT scanning indicated small duct pancreatitis with evidence of a previous laparoscopic cholecystectomy. Potentiated glucose tolerance test (GPAIS) performed before surgery confirmed normal baseline endocrine reserve. 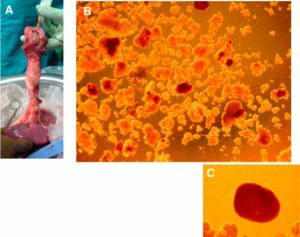 Total pancreatectomy with splenectomy surgery was carried out in September 2003, was uneventful, and an islet yield of 130,551 islet equivalents (IEQ) (1,632 IEQ/kg) was infused by gravity intraportally. The baseline portal pressure was 3 mmHg, and rose to 7mmHg post-transplant with no evidence of portal hypertension. Post transplant Doppler ultrasound at 24 hours and 7 days demonstrated complete portal venous patency. Following the surgery she received temporary exogenous insulin to relieve stress on engrafting islets during neovascularisation. Since early C-peptide values were 4.81 nmol/Land blood glucose levels stable (5.2-7.9 mmol/L) she was weaned off insulin by 10 days post transplant, and remained insulin-free for 2 years. She subsequently returned to small amounts of exogenous insulin likely associated with weight gain, but has not experienced severe hypoglycemic events with 11 years of follow-up. Although she required daily narcotics for 7 years before surgery, she was weaned completely from narcotic medications by 3 months post transplant. A 13-year old Caucasian female was referred after presenting at age 6 with recurrent pancreatitis. Genetic testing confirmed PRSS1 R122H mutation with a diagnosis of autosomal dominant hereditary pancreatitis. Severe pancreatitis episodes recurred monthly before referral, were of approximately 7 day-duration, required frequent hospitalization, resulting in excessive time away from school. Oral morphine was required to control pain. Pancreatic exocrine insufficiency with steatorrhea was treated with Creon (Abbott Laboratories, St-Laurent, Quebec, Canada) exocrine replacement. There was known family history of diabetes, pancreatitis and pancreatic carcinoma in a great-aunt and uncle. On examination, she was thin with a BMI of 18.1. During attacks, lipase was elevated. Magnetic resonance imaging (MRI) scan demonstrated an atrophic pancreas with a patent splenic vein (Figure 1). 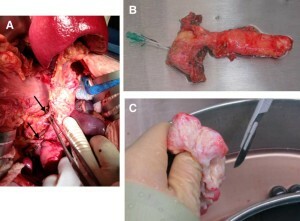 At surgery in February 2012, the pancreas was found to be fibrotic (Figure 2). Islet isolation yielded 464,523 IEQ (8,634 IEQ/kg) infused intraportally under gravity via the splenic vein stump. Baseline portal pressure of 6mmHg rose to 12 mmHg post-transplantation. Post transplant Doppler ultrasound at 24 hours and 7 days demonstrated complete portal venous patency. Figure 1. Magnetic resonance (MRI) cross-sectional imaging showing relatively atrophic pancreas (white arrow) and absence of pancreatic ductal dilatation. Figure 2. A, Intraoperative photograph of fully mobilized pancreas and spleen from Case 2. The black arrows mark both splenic and gastroduodenal arteries that are maintained intact until immediately before explantation and cooling. B, Total pancreatectomy after cooling and cannulation of the pancreatic duct, before intraductal collagenase distension in the islet isolation laboratory. C, Cut surface of the pancreatic neck demonstrating marked pancreatic calcification and fibrosis. She recovered well from the surgery and was discharged without complications. Exogenous insulin was weaned and discontinued by 3 weeks post transplant with stable glycemic control (5-7.5 mmol/L with most recent HbA1c 5.4%) currently at 27 months post surgery. Her chronic pain dissipated completely and she no longer requires any pain medication. She is a competitive swimmer and has qualified to represent her province. A 13-year old Caucasian female suffered from chronic pancreatitis with repeated bouts of severe upper abdominal pain requiring opiate analgesia spanning over seven years. Her quality of life was poor with multiple hospital admissions and continued absence from school. CT imaging revealed small duct chronic calcific pancreatitis, and genetic testing confirmed Spink-1 mutation with known associated lifetime risk of pancreatic malignancy (Figure 3) 13. Figure 3. Preoperative computed tomography (CT) scan of Case 3 demonstrating extensive pancreatic calcification in: A, Non-contrast phase. B, During portal venous contrast phase. In order to minimise both pain and long-term malignancy risk, total pancreatectomy was undertaken with concurrent islet autotransplantation in May 2013 (Figure 4). Figure 4. A, Cannulation of the main pancreatic duct after cooling of the pancreas/spleen explant for Case 3 on the back-table. B, Unpurified islet preparation stained with dithizone. Islets stained in red. C, Close-up of single large intact islet measuring 500 µm in diameter. The pancreatic body was markedly calcified, but despite this the islet isolation yielded 535,766 IEQ (6,748 IEQ/kg). Baseline portal pressure was 11 mmHg, and peaked at 22 mmHg following islet infusion. Doppler ultrasound at 24 hours and Day 7 confirmed complete patency of the portal venous tree. There were no surgical complications. By 4 weeks post surgery, glycemic control was excellent and after weaning and discontinuation of insulin, glucose remained between 4.7-6.7 mmol/L, with C-peptide 1.04 nmol/L and HbA1c is 5.5%, and remains off insulin for one year. She has been weaned slowly from opiate analgesia, but chronic pain continues to be evident (Table 1). Total pancreatectomy with islet autotransplantation can effectively control pain, eliminate future risk of pancreatic malignancy, and avoid risk of brittle hypoglycemia in patients with hereditary pancreatitis 14. Following surgery, all three children were successfully weaned off insulin at least initially afterwards, and two remain insulin free long term. Two achieved definitive and complete resolution of previously intractable pain, and the third has experienced improvement but continues to wean slowly from opiates. These results support a role for total pancreatectomy with islet autotransplantation as a first line surgical treatment for children with hereditary chronic pancreatitis. Delaying this major intervention until complete pancreatic burn-out occurs would obviate the potential benefit of islet autotransplantation, and should not be discounted even in the pediatric population. The option for islet autotransplantation has revolutionized the otherwise potentially devastating complications from total pancreatectomy. Brittle diabetes can severely impair quality of life with many associated risks including “dead in bed syndrome” resulting from profound hypoglycemia and risk of long-term diabetic complications. Islet autotransplantation preserves endogenous β-cell mass and stabilizes glycemic control thereby avoiding these risks. Our limited experience in the pediatric population is unique from the perspective that defined genetic variants associated with hereditary pancreatitis were present in all cases. Bellin et al in Minnesota have described a large single centre experience involving 53 children, of whom 55% were insulin independent after 3 years 15 , 16. In their children that failed to maintain complete insulin independence, a high proportion maintained euglycemia with once-daily basal insulin and maintained HbA1c <7% 17 , 18. Islet autotransplantation is more effective in securing early insulin independence than allotransplantation. Almost double the IEQ/kg islet mass is required with an allograft to achieve similar rates of insulin independence compared with an autograft 19. Furthermore, the attrition rate of islet autograft function over time is much less than observed in allografts, and is more likely associated with islet mass insufficiency following growth and weight gain, rather than any immunologic perturbation. Autotransplantation negates any need for immunosuppression with associated risks of malignancy, infection or renal toxicity. Sutherland et al 20 highlight the importance of achieving a high islet yield with strong correlation between islet yield and function. It is difficult to predict ultimate islet yield before surgery with some extensively calcified pancreases producing high yields, and other normal pancreas organs on imaging failing to isolate sufficient islets. It is clear that a prolonged history of unremitting pancreatitis prior to surgery exposes the pancreatic islets to increased inflammation, scarring and pancreatic fibrosis 21. Earlier surgery minimizes narcotic dependence 22 and eliminate the cancer risk in hereditary pancreatitis 23.A careful trade-off must be made between procedural risks and risk of future malignancy. A similar trade-off must be balanced of quality of life and time off school with recurrent hereditary pancreatitis, against the impact of the acute surgical intervention and chronic risks and long-term potential benefits. Currently, the majority of patients with chronic pancreatitis undergo endoscopic duct drainage to relieve pain as first line and if this fails, surgical procedures are tried. All other surgical pancreatic drainage procedures with the exception of total pancreatectomy with islet autotransplantation decrease islet yield. Consequently we advocate that this procedure be offered early in the setting of hereditary pancreatitis, especially in the pediatric population. Hereditary pancreatitis often results in children suffering from devastating pain, time off school, and increasing dependence upon narcotics. Total pancreatectomy provides an effective means of eliminate pain, but is associated with brittle diabetes. Pre-emptive islet auto-transplantation at the time of pancreatectomy is effective in stabilizing glycemic control without risk of hypoglycemia. The primary aim is to relieve pain and restore quality of life. We advocate use of this procedure earlier in the disease course before the pancreas becomes fibrotic to preserve auto-islet mass, and to further minimize opiate dependence. The Clinical Islet Transplant Program receives research funding from the Juvenile Diabetes Research Foundation, The National Institute of Diabetes and Digestive and Kidney Diseases of the National Institute of Health and by charitable donations administered through the Diabetes Research Institute Foundation Canada. The clinical program is supported through Alberta Health Services. AMJS is supported by a Scholarship from Alberta Innovates – Healthcare Solutions and JDRF 4-2008-812 and NIH/NIAID 5U01AI065191-05. AMJS is a member of the Alberta Diabetes Institute, and holds a Canadian Institutes for Health Research Chair in Transplantation Surgery and Regenerative Medicine. The authors of this manuscript have no conflicts of interest to disclose as described by CellR4. Blondet JJ, Carlson AM, Kobayashi T, Jie T, Bellin M, Hering BJ, Freeman ML, Beilman GJ, Sutherland DE. The role of total pancreatectomy and islet autotransplantation for chronic pancreatitis. Surg Clin North Am 2007; 87(6): 1477-1501, x.
Piemonti L, Pileggi A. 25 Years of the Ricordi Automated Method for Islet Isolation. CellR4 2013; 1(1): e128. Sutherland DE, Radosevich DM, Bellin MD, Hering BJ, Beilman GJ, Dunn TB, Chinnakotla S, Vickers SM, Bland B, Balamurugan AN, Freeman ML, Pruett TL. Total pancreatectomy and islet autotransplantation for chronic pancreatitis. J Am Coll Surg 2012; 214(4): 409-424; discussion 24-26. Bellin MD, Sutherland DE, Beilman GJ, Hong-McAtee I, Balamurugan AN, Hering BJ, Moran A. Similar islet function in islet allotransplant and autotransplant recipients, despite lower islet mass in autotransplants. Transplantation 2011; 91(3): 367-372. Forlenza GP, Chinnakotla S, Schwarzenberg SJ, Cook M, Radosevich DM, Manchester C, Gupta S, Nathan B, Bellin MD. Near-Euglycemia Can Be Achieved Safely in Pediatric Total Pancreatectomy Islet Autotransplant Recipients Using an Adapted Intravenous Insulin Infusion Protocol. Diabetes Technol Ther 2014 Jul 28. [Epub ahead of print]. Sutherland DE, Gruessner AC, Carlson AM, Blondet JJ, Balamurugan AN, Reigstad KF, et al. Islet autotransplant outcomes after total pancreatectomy: a contrast to islet allograft outcomes. Transplantation 2008; 86(12): 1799-1802. Braganza JM, Lee SH, McCloy RF, McMahon MJ. Chronic pancreatitis. Lancet 2011; 377(9772): 1184-1197. Lowenfels AB, Maisonneuve P, Cavallini G, Ammann RW, Lankisch PG, Andersen JR, et al. Pancreatitis and the risk of pancreatic cancer. International Pancreatitis Study Group. N Engl J Med 1993; 328(20): 1433-1437. Rossi L, Pfutzer RH, Parvin S, Ali L, Sattar S, Kahn AK, et al. SPINK1/PSTI mutations are associated with tropical pancreatitis in Bangladesh. A preliminary report. Pancreatology 2001; 1(3): 242-245. Malka D, Hammel P, Sauvanet A, Rufat P, O’Toole D, Bardet P, et al. Risk factors for diabetes mellitus in chronic pancreatitis. Gastroenterology 2000; 119(5): 1324-1332. Desai CS, Stephenson DA, Khan KM, Jie T, Gruessner AC, Rilo HL, Gruessner RW. Novel technique of total pancreatectomy before autologous islet transplants in chronic pancreatitis patients. J Am Coll Surg 2011; 213(6): e29-34. Whitcomb DC, Pogue-Geile K. Pancreatitis as a risk for pancreatic cancer. Gastroenterol Clin North Am 2002; 31(2): 663-678. Ong SL, Gravante G, Pollard CA, Webb MA, Illouz S, Dennison AR. Total pancreatectomy with islet autotransplantation: an overview. HPB (Oxford) 2009; 11(8): 613-621. Kobayashi T, Manivel JC, Carlson AM, Bellin MD, Moran A, Freeman ML, Bielman GJ, Hering BJ, Dunn T, Sutherland DE. Correlation of histopathology, islet yield, and islet graft function after islet autotransplantation in chronic pancreatitis. Pancreas 2011; 40(2): 193-199. Malka D, Hammel P, Sauvanet A, Rufat P, O’Toole D, Bardet P, et al. Risk factors for diabetes mellitus in chronic pancreatitis. Gastroenterology 2000; 119(5): 1324-1332, and islet isolation achieves a higher β-cell mass if carried out pre-emptively ((Cui Y, Andersen DK. Pancreatogenic diabetes: special considerations for management. Pancreatology 2011; 11(3): 279-294. Angst MS, Clark JD. Opioid-induced hyperalgesia: a qualitative systematic review. Anesthesiology 2006; 104(3): 570-587. Whitcomb DC. Inflammation and Cancer V. Chronic pancreatitis and pancreatic cancer. Am J Physiol Gastrointest Liver Physiol 2004; 287(2): G315-319.